Our clients entrust us to protect their information and provide well secured transactions. We highly value this trust and prioritize ensuring that businesses working with us are properly shielded against identity theft and all other forms of attack. We provide not only physical security in our data centers but we also take extra measures and apply necessary security standards to how your data is being stored, accessed and transmitted. 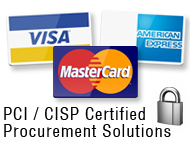 We are PCI DSS (Payment Card Industry Data Security Standard) compliant and we maintain our compliance status by creating secure, regularly-assessed environments and processes related to the handling of payment card data and other important information. We create and maintain a secure cardholder environment (CDE) to protect our customer's data and apply internal security strategies to help prevent future problems. We install and maintain a firewall configuration and secure FTP and other secure protocols for any integration. We use secure VPN tunnels for internal access. Our applications are guarded with secure HTTP protocol with strong 256 bit encryption. For extra security, we require our clients to change all default passwords (which we provide) to passwords of their choice and require regular password updates. ePS provides multiple layers of defense and a secure data protection model. We combine both physical and virtual security measures. We encrypt transmission of cardholder data across all public networks. We routinely monitor and update our systems, apps and anti-virus software to accommodate any new security vulnerabilities. We limit the number of personnel having access to cardholder data. This lessens the chances of a security breach. We follow best practices like: password encryption, authorization, authentication, password updates every 30 days, log-in time limits, etc. We track user activity and other events throughout all our servers and store archives. These will help ePS to pinpoint the source in the event of a security breach or other related issues. At ePS, we maintain a strong and effective information security policy. Customers can rest assured that they are well protected against security breach of any kind.